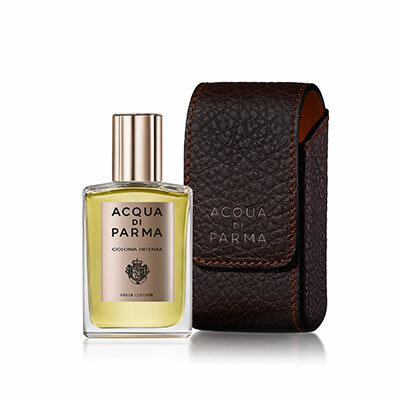 Colonia Intensa Eau de Cologne Travel Spray with Leather Case is a tribute to the traditional values of Acqua di Parma. Colonia Intensa Eau de Cologne Travel Spray with Leather Case harmoniously blends elegance with practicality. The elegant leather case fashioned in a classic shape from exclusive materials, is an example of renowned Italian craftsmanship containing a 30ml bottle of Colonia Intensa. Acqua Di Parma Colonia Intensa begins with a fresh burst of calabrian bergamot and Sicilian lemon, enriched with vibrant cardamom and ginger, over an aromatic heart of myrtle and mugwort, with refined and clear accents of neroli and a base of sophisticated leather, cedarwood, lignum vitae and patchouli with background accents of benzoin and musk.